This American Lotus bloom in 2013, from my favorite Lotus laden pond, was one among many. The 2014 and 2015 Lotus blooming seasons in said pond have not been as prolific, leaving yours truly with a serious case of Lotus deprivation. 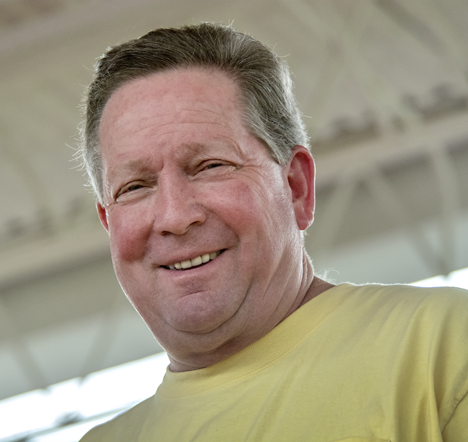 Click here or on the picture to see our original 2013 post. The late spring and summer of 2015 is the second such season in a row that I have experienced disappointment with Mother Nature’s quirky behavior. During the same months of 2013, my favorite colony of American Lotus (AKA Water Lily) held forth with an abundance of of blooms, followed by Lotus baby-making pods. 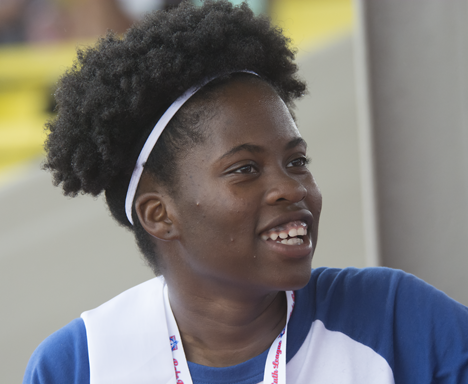 Click here to see the 2013 pictures. 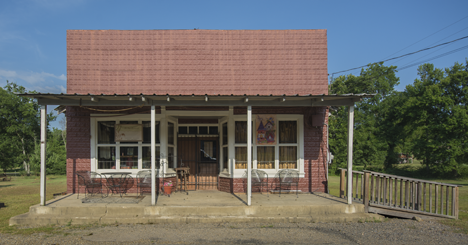 FYI, the colony sits in a pond in the southeast corner of the junction of I-530 and South Hazel Street in Pine Bluff. Arkansas in full view of passing motorists whom I suspect barely notice the blooms in a good year and not at all in the poor years of our most recent experience. During the 2014 season, there was a decided lack of precipitation leading to a puny pond which proffered only a pitiful performance by the colony. I watched with eager anticipation as the frequent and voluminous of 2015 maxed out the water level in the pond – all to no avail, Lotus wise. The rub was, the conditions also maxed out some sort of evil water weed which apparently all but choked out the Lotus performance. I saw a couple of blooms only. So, suffering extreme Lotus deprivation, I am winging us back to August 2013 to see the waning moments of that fine season. 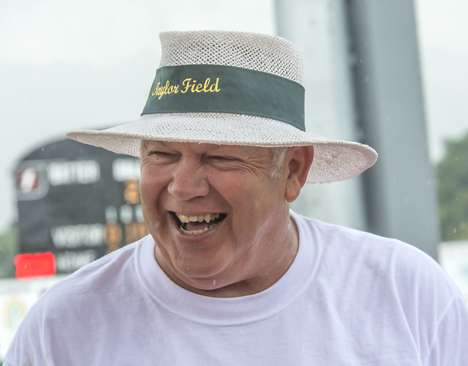 Also be sure and see t the comments and pictures for this story on the Photo of the Week page at Corndancer dot-com. 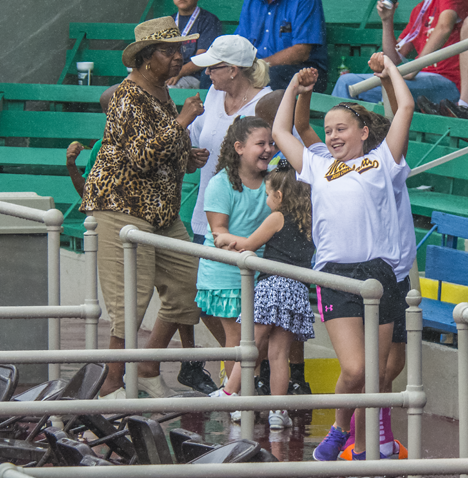 During the rain delay the the announcer invited women and girls to dance in the aisles for a prize. These participants are having at it. 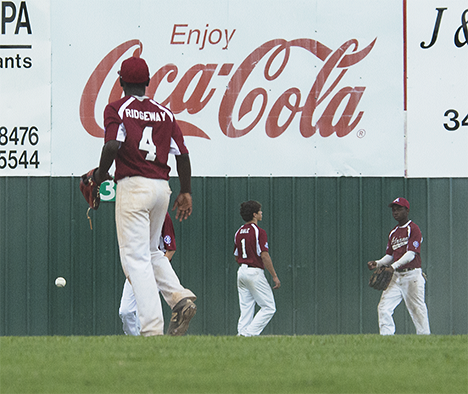 While on assignment to photograph the championship game of the Babe Ruth 14-year-old World Series in Pine Bluff, Arkansas, I was forced from the field to the stands by an untoward, but fortunately short-lived, thunderstorm. 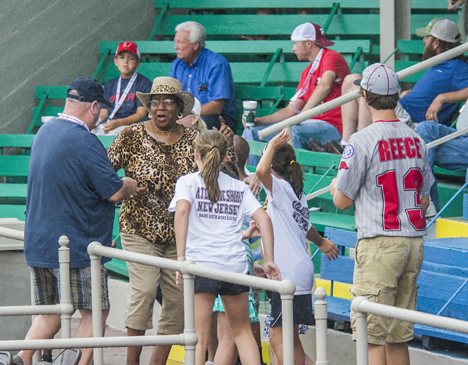 So here is a photographer-writer thrust into a rain-delay with a long-lens camera, with nothing else to do but record my fellow residents of the stands. Take a gander. 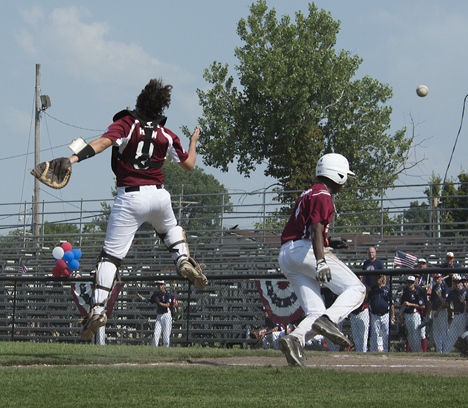 But first, I strongly suspect that you also want to see some baseball action from the tournament. 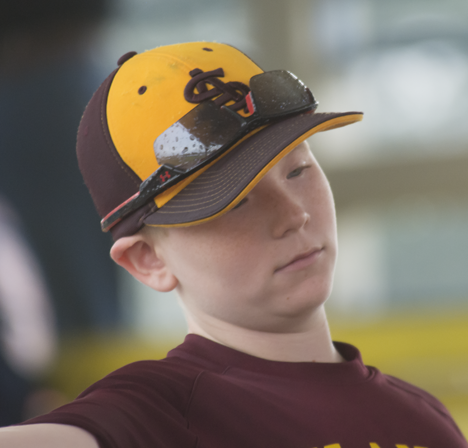 You can scratch that itch for action by going to the Photo of the Week page at Corndancer dot com where you can see plenty of action shots. We’ll wait here while you look. Ms. Evelyn Horton was the prize winner. 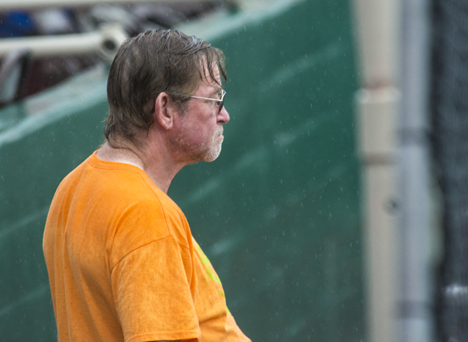 This fan watches the rain with hopes of a hasty ending to the precipitation. 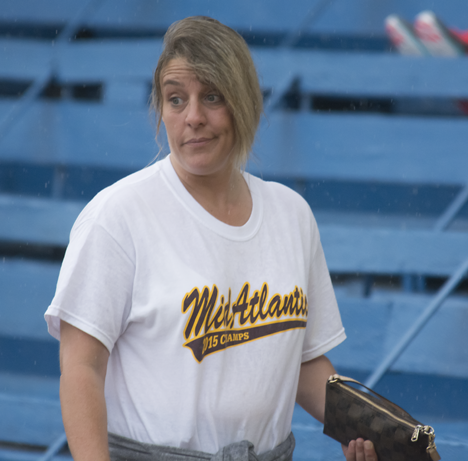 Rain does not matter to this baseball fan. One looks at the phone, the other at the rain. She has seen someone, something or a set of circumstances she likes. Well, watching rain can become a tad boring. 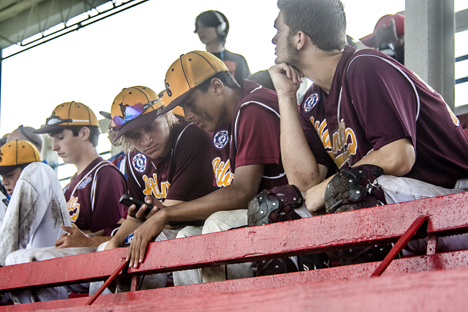 One of the teams waits out the rain in the stands. 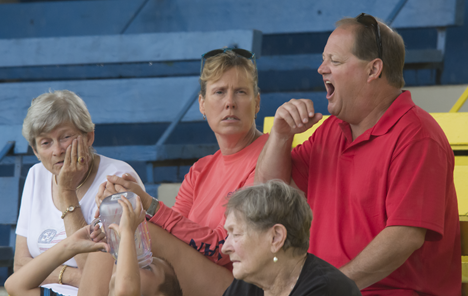 These girls in the stands don’t seem to mind the inconvenience. 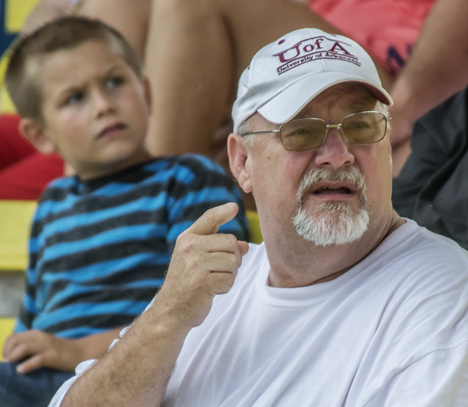 Five will get you ten their grandson is a player. This New Jersey photographer has the same idea as me. 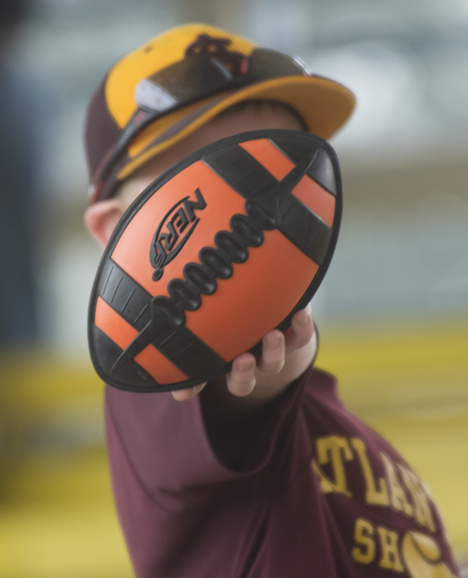 Hey, look at my football! Duke Fakouri flashes a grin. The rain ended shortly after I shot the last image for this gallery. 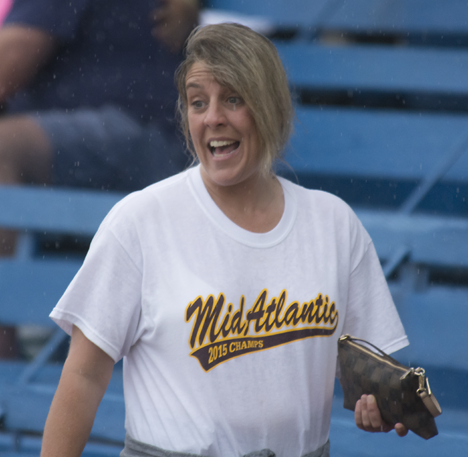 The Atlantic Shore team hailing from the Atlantic City, New Jersey went on to win the tournament in a hair-raising finish. 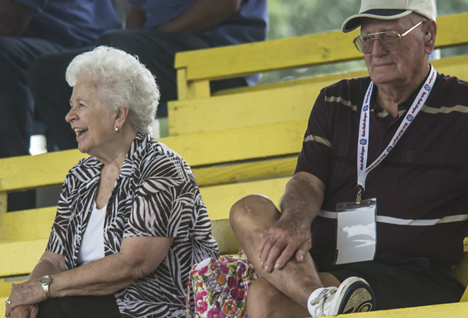 Our congratulations to them, to the other teams and to the hundreds of local volunteers working with the Babe Ruth Baseball staff for making this tournament a huge success. One of life’s most embarrassing moments is when a runner scores totally unimpeded by accurate and timely defensive efforts. This only if you are not the runner. 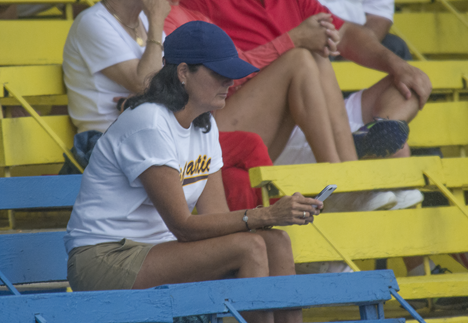 At athletic events, there are two media types, those who sit in the heated and/or nicely cooled press box and then the rest of us who are down among the gladiators in either blazing sun, freezing wind, untoward precipitation, and/or on rare occasions, a moderation which is none of the above. Click on dusty guy to see more sports pix. That said, most of us downstairs are recording imagery of one sort or another and we leave with said images in hand. 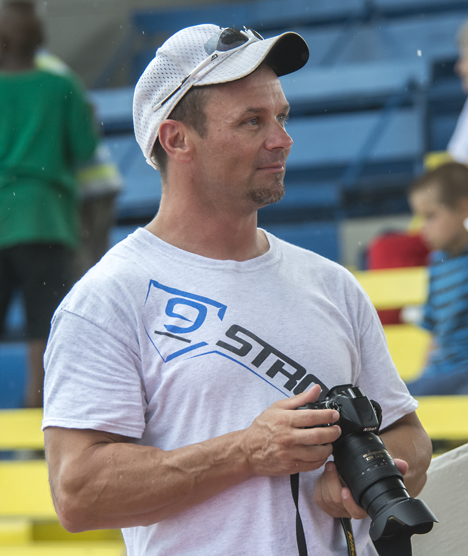 Most of the sports images you see depict the dramatic moments of sports. Rarely do you see the oops moments, but most of us hang on to ’em. Today we reveal what is not normally seen – or a frame or two away from what was seen. At this point we encourage you to wander over to the Photo of the Week page at Corndancer dot-com and see similar imagery. We’ll wait here while you look. Another moment of introspection — when no one seems to know what to do with the ball. 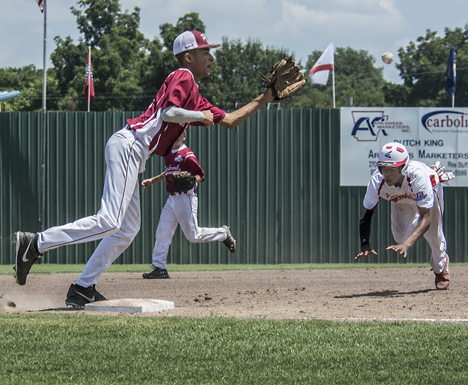 And finally, that moment of reality when the runner realizes that stealing third base was not such a cool idea after all. 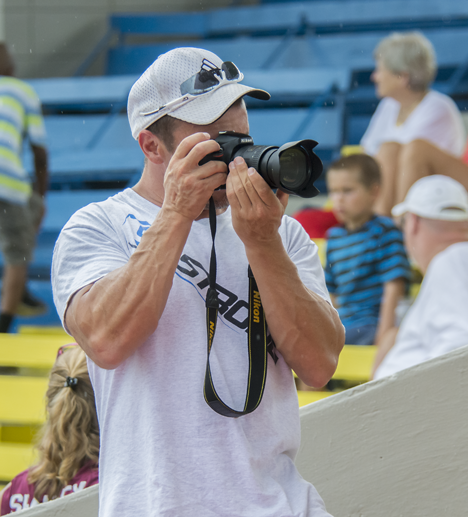 Today, you have taken a peek at the underbelly of sports photography. Hope you enjoyed the brief sojurn. This is Katy, our reluctantly friendly nearly Russian Blue. There’s a very friendly little cat lurking behind a finely tuned instinct for survival beneath that fine gray coat. The nick in her ear probably comes from a territorial or defensive conflict with another one of Gods’ critters. Click on the kitty to see more about him. Despite the name of this treatise you only get a tale of one cat here. 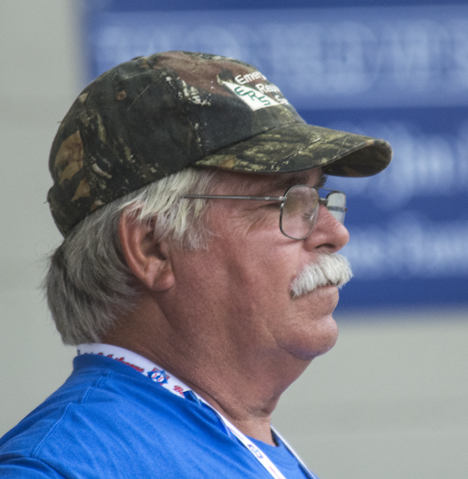 The other is available on our sister story-site The Photo of the Week page at Corndancer dot-com. Click and go look. Here at the Chez Dempsey, we are cat people. I came by in naturally since Dempsey men are imbued with a cat-loving gene. Patricia Ann, my spousal unit, fortunately bought into the cat deal lock, stock and yo-yo. She is now a certifiable cat-nut just like her spousal unit. All that said, the object of our affection today is Katy, our nearly Russian Blue. 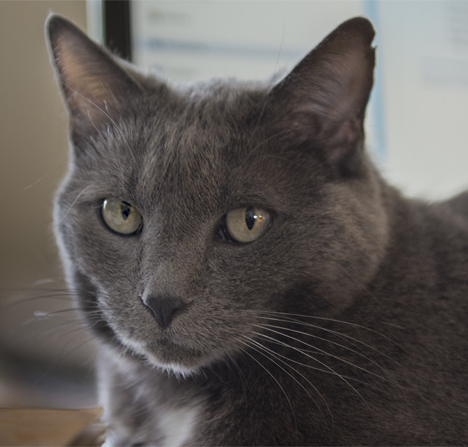 Several years ago after we lost our beloved Grits Dempsey, a big ol’ super friendly Rag Doll cat, we did an internet search targeting a Russian Blue or nearly Russian Blue who get along with other cats and contemporaneously with the dogs who resided with the subject cats. We found a “male Russian Blue about a year old who gets along with other cats and dogs.” Bingo. Perfection. We made arrangements to pick up the kitty at a nearby veterinarians. I began to suspect the description was lacking in the truth and veracity categories when I first laid eyes on a squirming little gray cat barely past the kitten stage. When we attempted the transfer, she (not he) broke loose. The ensuing chase around the vet’s reception room made the Haymarket Square riot look like an octogenarian afternoon tea party. It was tantamount to a marathon confined to fifty square feet programmed like a pin ball machine on steroids. After we manage to catch the screaming meemie and get her into the carrier, she voices her objections for most of the 25 minute ride back to headquarters. When turned her out she scampered to a closet in the back of the house and refused to leave. I could hear occasional movement in the closet but could not lay eyes on the little gray beast. We set a water and food bowls outside the closet door along with a cat box and hoped for the best. As the days went by we observed the food and water bowls diminishing and tell-tale signs of other bodily functions in the cat box. After five days, we were sitting in the den and the reclusive little feline shocked us by hopping up into Pat’s lap. She stayed for a while and then repaired by to her (my) closet. Little by little she made peace with her surroundings. We discovered that when we picked her up she goes berserk, which means that sometime in the past, someone picked her up and did some mean things to her. I continue to hope I can meet this sorry piece of humanity sometime and that on the occasion of the meeting the Almighty will see fit to put a table leg or Louisville Slugger in my hand at the same time. The results will not be pretty. Now, though she is acclimated, she is no one’s cat in particular, but prefers me above all other humans. She comes to greet me in the yard. She sits on my chest at night when I am attempting to read in bed. She comes to nose me around when I wake up. She usually comes in to visit when I mount the porcelain throne. She also loves laptop keyboard as a place to recline. 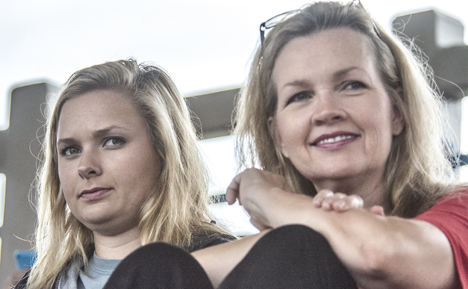 She is still very suspicious of people standing up including me. My observation is that she wants to be friendly but her survival instincts set boundaries. Now that we understand that, she and I get along very well. 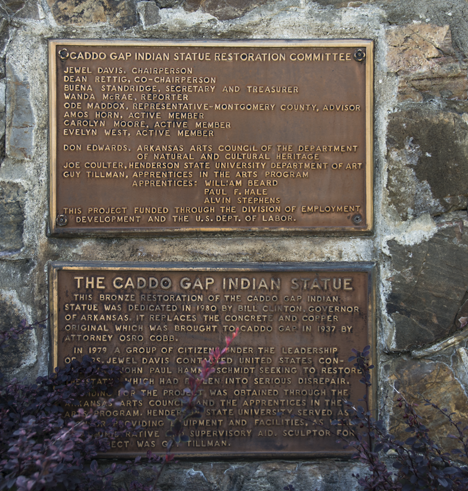 The statue of the Caddo Indian is not immediately visible in Caddo Gap unless you leave the main highway and drive through the east part of the town. It is more than “well-worth” the slight detour. 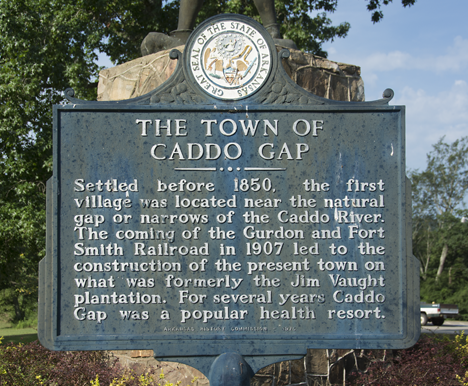 During my recent meanderings about west central Arkansas in the foothills of the Ouachita (pronounced wash-eh-taw – emphasis on the first syllable) Mountains, I had occasion to pass through Caddo Gap, Arkansas. The first time I breezed through with peripheral glances only. The second time, I drove through what one presumes was the former epicenter of the way-back-when formerly thriving community. 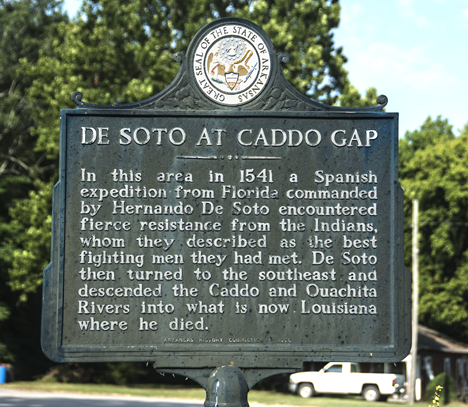 I discovered that Caddo Gap is steeped in history all the way back to Hernando DeSoto. The third time was the charm as I stopped frequently to engage the Nikon. 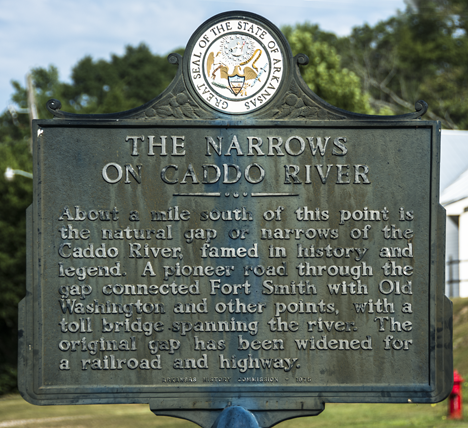 Before we get knee-deep in the Caddo Gap story, I suggest that you take a glance at the Photo of the Week page at Corndancer dot-com where we explore “the road to Oden.” Oden is in the same geographic neighborhood as Caddo Gap. The drive to Oden from also-nearby Black Springs was a great country road trip after we left Caddo Gap. The road did not have as many afternoon photo ops as I had hoped, but the ones it afforded were good discoveries which made the trip very much worthwhile. 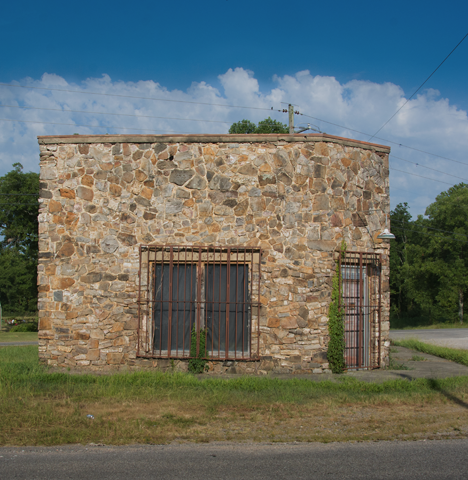 I’m not certain that this old structure started out in life as the local hoosegow, but it sure looks like it was at some point before it fell to disuse. It looks to be in good condition. Here’s a slightly different view of the building showing more local environment. 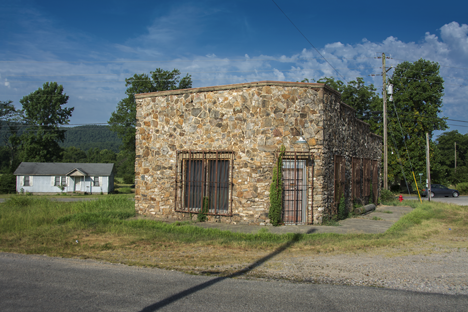 Up the the street from the stone structure is this nicely restored store building. I am derelict that I did not get closer to retrieve the message on the sign in the door. It even complies with ADA requirements (we think). 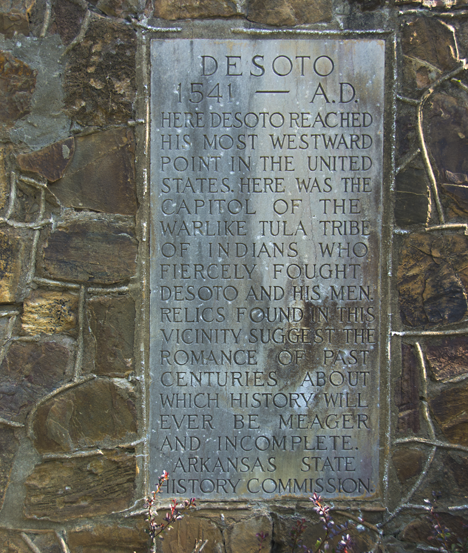 The short version of DeSoto’s visit is engraved on the pedestal of the statue. 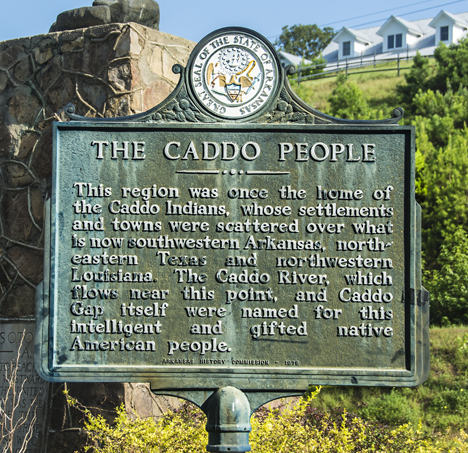 This historical marker tells of the Caddo people who once inhabited this locale. Here’s more on Bro. Desoto and his adventures in these parts. 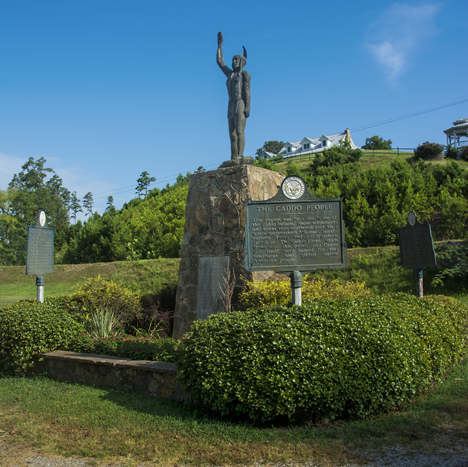 Here’s some info on how the markers and statue came to be and were later restored to the state you see in the pictures. Hope your screen permits reading. For history nuts, these are tidbits to broaden your base of knowledge. For non-history nuts, we hope you found a bit of interesting information. In any case thanks for looking.